There has been a lot of build up to the release of Cane Hill‘s third album (if you count their self-titled debut as an album and not an EP). The band, hailing from New Orleans, Louisiana have openly talked about dropping acid during the albums inception and to many up to this point represent a resurgence in the Nu-Metal scene, regularly crossing the lines of Slipknot, Alice In Chains & KoRn with their first two albums. 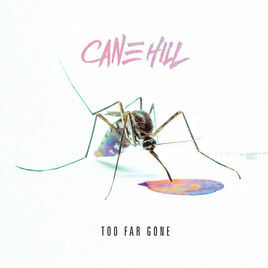 The album gets off to a blistering start with the title track “Too Far Gone”, the first of four pre-released singles which preceded the album. Guitarist James Barnett delivers a crushing riff that sounds like it belongs on Slipknot’s 1999 self-titled debut. The video the accompanied the song is clearly a reference to the aforementioned acid dropping antics, as are the lyrics. “Lord of Flies” then takes a slightly different direction, Elijah Witt’s vocals being mostly sung rather than screamed. It’s a song of quality but coming in after the blistering opener, it does lose some of its edge but will have you singing along. “Singing In The Swamp” starts with some off kilter guitar chords played without an amp as an intro of sorts for the first 30 seconds before the main riff kicks in. It’s stripped back vocal work is a step back from the previous two songs and is an attempt at showcasing another side of the band. It’s more of a Hard Rock song than a Metal one. The steady build then closes out with a heavier final minute with a decent solo. You would struggle to find three more different opening songs on an album and three songs in you actually find yourself asking where the album is going. The answer isn’t what you’d expect. Instead of picking up a gear it drops down one with “Erased” and it’s follow up “Why?”. “Erased” is a slow burn that picks up and drops down again, soaking in dark atmospherics and clean singing in the same way that “Singing In The Swamp” does but lacks that edge until a killer 10-12 second part around the 3 minute mark before dropping back into a mediocre chorus. “Why?” has Elijah Witt experiment with effeminate vocals in the way that Deftone‘s Chino Moreno does while delivering a funk-metal sound that ends up being a poor mans KoRn meets Deftones meets Alice In Chains. It’s hard to tell if this is a musical style shift for the band or an attempt at maturity. By this point we’ve had a trio of songs which while they have some interesting parts, are a world away from the opening pair. They demonstrate a real lack of ideas and quality. If they were demos or b-sides or bonus tracks, you’d be more forgiving but they aren’t. Fortunately “It Follows” is a huge step up. Another one of the pre-release songs that by this point seems to have given a false impression of the album. The song fits well with the opening pair, it’s marching riff and coarse vocals are once again a move in the heavier direction that suits the band better. “Scumbag” ups the tempo dramatically and once again is reminiscent of Slipknot’s 1999 self-titled debut with it’s screamed chorus, looped samples and blistering guitar work, again a world away from “Why?”. “Hateful” is another heavier track, a pace drop from “Scumbag” but in keeping with it tonally. It’s a song with power and purpose designed for that sing-a-long in the the live show with a clear call and response section before a powerful closing. “10¢” once again ups the pace and brings the breakdown and solo. The buried electronics are also also a neat twist. “The End” is a dark atmospheric track with an almost tribal drum pattern and a hypnotic quality to it before a powerful closing.